Here’s a fun one: gummy bears. It’s weird how much they’ve been popping up in my life lately. I originally saw the chandelier below on a design blog, called Likecool, this past March. Then in August, I saw stills from Nickelodeon’s TV show, iCarly, of the main character’s bedroom and knew I wanted to write about it. In September, a friend sent me a link on giant gummy bears. I’ve since seen a commercial on TV for adult gummy vitamins. And finally, it culminated in a nostalgic discussion of the cartoon Gummi Bears and their Gummi Berry Juice with my co-workers. It’s funny how life works like that, as soon as you become aware of something, you see it everywhere. Anyway, back to design. What is it about gummy bears? I’ve always liked them, and clearly, I’m not alone. I had a bracelet made up of acrylic gummy bears growing up. They’re like shiny, glowing gemstones, that are sweet and gooey. As a child, I don’t think it could get much better than this. And even though I was growing up in the 80s, thirty years later, they are still as popular as ever. Of course, it’s not like I was the first child to have this fascination. In the early 1970s, Willy Wonka and the Chocolate Factory (based on the 1964 book by Roald Dahl) came out in theaters and we all caught our first glimpse of a Gummy Bear tree. Carly Shay’s bedroom, is every little girl’s dream room. Colors abound, like an over-sized jewelry box, every surface in that room sparkles or twinkles. While the chandelier is a known design object, as well as some of the other lamps, the rest of the set was created by a very talented and young-at-heart, art department. (Here are their credits on IMDB.com.) 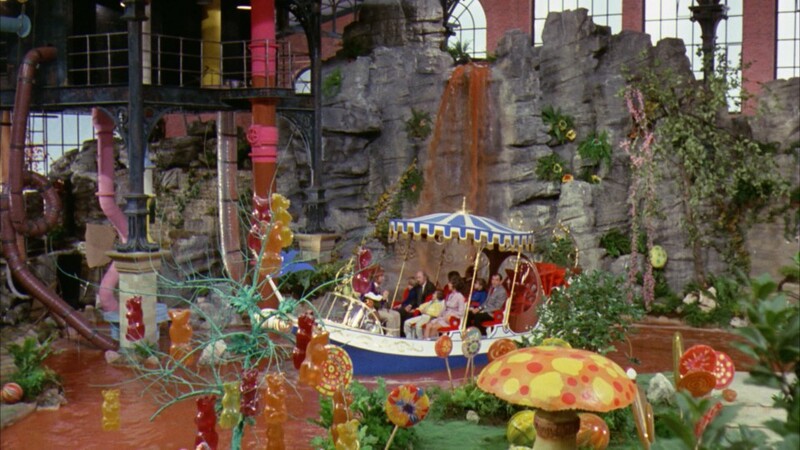 With Harry Matheu as Production Designer, Jason Howard as head of Set Decoration and Art Direction by Jim Jones, they managed to create a candy palace. A sort of Dylan’s Candy Bar as a bedroom. These lights, pictured above, are also available at Jellio.com and are LED, battery operated lights. The practical adult in me thinks, “oh good, so there’s no electrical cord to mess with.” But, eight year old me thinks, “cool! so you can put them anywhere and take them with you anywhere too!” I like the eight year old me. The plot of the episode of iCarly where the gummy bear room is revealed, “iGot a Hot Room”, starts with Carly’s older brother making her a gummy bear lamp of his own design, for her birthday. But when Spencer’s gift ends up setting her room on fire, her bedroom is re-created into the gummy bear wonderland that we see pictured. If you’re wondering how to make this room in your own house, Nate Berkus created his version on his show. Now …who else has a craving for gummy bears? What’s your favorite flavor? Mine’s pineapple. I WANT ALLT HIS STUFF SOO BAD!!!! I WANT TO REMODEL MY ROOM AND GET SOME OF ICARLY’S FURNITURE!!! WHAT SHOULD I DO? I want to know where you can get all this stuff! I saw the gummy bear lamp, and the Ice Cream bench, but i cant seem to find the sailboat table! I can make it myself but it would save a lot more time if i just ordered it. If you have any suggestions, that would help. Thanks!